Whether we work with “energy” or not the fact remains that there is always energetic transfer when we are interacting with our environment, and not all energy interaction leaves us feeling comfortable. If we have “loose boundary protection” we may in fact be quite vulnerable to the energy of those around us. For the skeptic – think of it this way.. you are in a great mood you go to the shops, and at the check out you are next to someone who seems to be completely down and miserable, and even snappy in their manner. By the time you leave the shop, you feel inexplicably in a bad mood that “came from nowhere”. By my definition – you just actively participated in an energy exchange whether you gave permission or not. On the other hand, we might be drained from others who are acquaintances, colleagues or friends and adult family members who place their expectations up on us. The information provided below is purely my understanding and a couple of techniques for you to draw on and expand on and develop to suit your own needs and comfort levels. The photo at the top of the page shows "cords" going from one heart chakra to another and is deeply embedded. Given that the photo shows that the cord is anchored in both hearts, it would appear to be consenting, however, there becomes a huge energy transfer and it is difficult to seperate one persons view point or feelings from the other (and probably for themseleves as well). In fact I won't speculate on what the cord means - when we do the cord cutting exercises ourselves then we tend to find the cause and meaning behind it in the process. Some cords are appropriate - some aren't. We have to follow our individual guidance in relation to this. The photo to the left shows on an energetic level the "binding" practise that some wiccans or other pagan groups might use. Usually when they do this they will "bind two hands together" to reinforce the intent that they will not seperate and walk different paths. It is my belief and guidance that binding is an inappropriate cord and suggests energetically a desire to control another (if there hasn't been consent given), or the fostering of dependency (which goes against my own inner moral compass), or may even indicate or suggest when consent is given - an attachment or personality disorder, however, it is also part of a marriage like celebration/ritual for many pagan or earth-based groups, in which case it is not an inappropriate binding because the individuals still have free will to unbind or leave the relationship should they feel guided to at a later date - in this way it represents and cements a commitment to each other. I also understand that usually these "binding ceremonies" are not for the long term - they may bind for 2 years, or five years or seven years, and at the same time, they may even decide to bind again once this time frame expires. In a way it is a form of marrying for a set number of years, and then they renew their "vows" again for a set number of years to allow individuals free will to develop in their own ways and acknowledging and respecting that we don't all grow in the same direction or walk the same path throughout the entirety of our lives. Other "cords of attachment" can occur when working with people or spirits that have their own issues of dependence and independence. They don't know how to draw the universal or divine energy themselves so they (most of the time without realising), put cords into chakras of ourselves, because our energy "feels good to them". Bear in mind - this kind of behaviour can only occur if /when our own boundaries are compromised, and if we make self care a priority for ourselves including monitoring our own auric fields and chakra balancing -then we will experience this less and less. Start by creating your quiet space – focus on the breath, in and out, breathing in for the count of three, holding for three, and exhaling to the count of three. Repeat this exercise a few times and then as you relax visualise yourself or your aura in your minds eye, much as if you were a bird in the sky looking down upon yourself, and flying around your auric body. Call upon your guides and your higher self to assist you during the process of cutting any cords of negative attachment, and give thanks. You are foucssing your intent for highest good and greatest joy. As you scan your aura you should be able to see cords coming and going from it. Over time you will learn to identify what the places of attachment mean. The cords my be into hands or knees, or chakras, or into they may be projecting at you from the front or the back. The other really important and crucial insight here as well - is scan to see if YOU are projecting cords into others. You will definitely be able to tell the difference in the feel and energy of it. When you see the cords, you will want to cut them. Someitmes we need to do this exercise again and again, and sometimes we might need to put the scissors down and see ourselves with an axe or a chainsaw. I know of one person who tried this exercise and told that they ended up puling out an oxy welder and firing at the cords to disintegrate them (this was an unhealthy cord to a past romantic relationship that she consciously wanted to move on from, but "kept lapsing backwards). process. Tell them that you want to be assisted with whatever you need for your “highest good”. Now scan your aura, assess it for cords coming to or from it. As a point of interest and for later reflection take note of where the cords are entering and leaving your aura, and the thickness of the cords. If possible you can follow these cords and see who/where the cords are going. Advise your guides that if it is appropriate and for your highest good that you would like to see these cords cut and severed. Many people are deterred from doing this exercise as they come from the perception that to cut cords to their romantic partners, or their adult children that it equates to “breaking the love connection”. This is not the case. We will still be able to have and to hold love for them, and the love we have will be a healthier form of love without the draining that can occur. It will also assist us in giving unconditional love to them, where we seek to neither control or be controlled by them. I personally do not recommend cutting cords to our small children as we need those cords on a physical aspect (in my opinion of course). DO NOT cut the cords that go from the centre of your crown into the universe (this is your “divine heavenly connection”, and DO NOT cut the cords from your feet to the core of the earth (this is your connection to source/Mother earth energy). Either way -if you are following your own guidance and you are invoking the “powers that BE “ to assist in the process – you don't need to fear cutting cords that it would be unwise to cut. Your statement of intent at the beginning of the exercise is for “inappropriate cords of attachment to be cut. 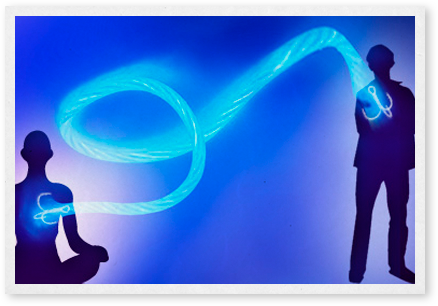 The cords actually offer information and insight in where we can direct healing energy for ourselves. For example, if we see great cords coming from our solar plexus to another individual – we are often being a victim or have handed our sense of personal power over to another. By cutting the cords we are taking the first steps in reclaiming that sense of empowerment. Cords from the hands only – can indicate that we are holding onto the past, and need to release it and let it go and move on. I will then stand or sit in that quiet space without straining and just allow myself to receive the healing energy, by focussing on my breath. If your clairvoyance is highly developed- you may " see" a being of light using the "blue sword" around you to purify your aura. The picture to the right shows a healthy relationship between two people,where they share energy that is beautiful and loving but they do not have cords running from each other. They are open and receptive to each other,but they are not draining each others energy centres. This might be defined in certain circles as a relationship where the two are individuals who are emotionally independent but choose to be with each other through love. in fact if you look closely at this auric image, you can see that their third eyes are pointing at each other and so therefore one can assume that the artist was attempting to portray romantic love on an auric level.